Somehow, it’s already August and that means the Melbourne Writers Festival is just around the corner. 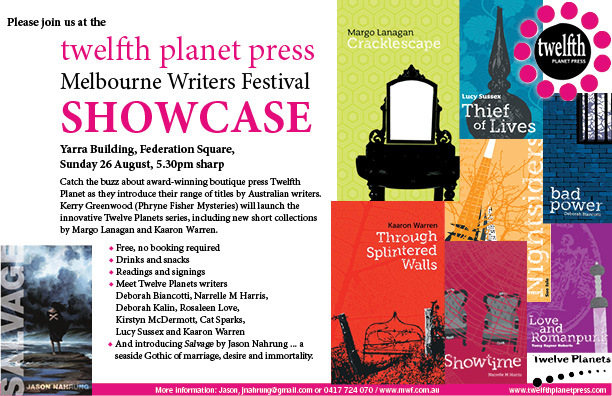 Twelfth Planet Press is hosting a fun little shindig this this year so, if you’ll be in Melbourne later this month, please come along. As well as being a general showcase of TPP’s exciting adventures in publishing thus far, the event will highlight the acclaimed Twelve Planets series of story collections and launch the two latest releases: Through Splintered Walls by Kaaron Warren and Cracklescape by Margo Lanagan. There’ll be drinks and nibblies and lots of clever, witty writers. We’d all love to see you!